Lines caused by facial expressions are always visible. We use about 60 muscles while communicating both through speech and with facial expressions. Frowning, the lifting of eye-brows, laughing, pulling a face are some typical facial expressions that we use to communicate. As time passes and with frequent use of these facial movements, these wrinkles persist and become permanent deep wrinkles on the forehead, laughter lines and crow’s feet. Besides injection there is a clear consumer need for effective, safe topical treatments. SYN®-AKE is based on a patented mechanism. It mimics the essential amino acid sequence of the Waglerin-1 functionality. SYN®-AKE‘s safety and activity has been thoroughly tested. SYN®-AKE is a small molecular weight synthetic peptide that smoothens expression lines by topical application. SYN -AKE has a natural inspired mechanism. It mimics the activity of Waglerin-1, a natural occurring peptide found in temple viper venom (Tropidolaemus Wagleri). Waglerin-1 has a strong ability to relax muscle contraction. 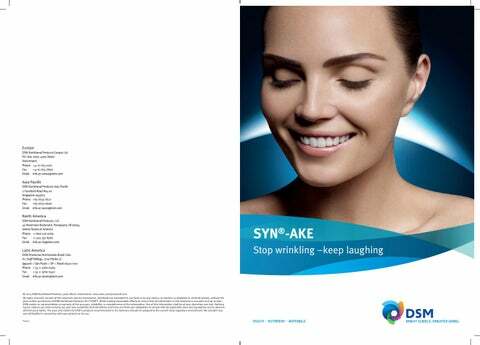 SYN®-AKE – Age-killing effect The measurement of the smoothing and anti-wrinkle effect of SYN®-AKE (4%) was compared to a placebo. A cream was applied to the forehead twice daily for 28 days. The study included 15 volunteers per group (age 40–60). Wrinkles on crow’s feet Measurement of the smoothing (Ra) and anti-wrinkle effect (Rz and Rt) of SYN®-AKE (4%) measured on the crow’s feet after 28 days. The efficacy of the SYN®-AKE tripeptide90(0.5 mM) has been demonstrated in vitro by measuring the frequency of contraction of the innervated muscle cells as a function of the incubation time. Its effect focuses on an immediate and lasting relaxation of mimicry wrinkles by blocking the neuronal transmission on the Nicotinic Acetyhlcholin receptor. The peptide is an antagonist of the muscular nicotinic acetylcholine membrane’s receptor (mnAChR). As the muscular nicotinic ACh receptors are blocked, the ion channel remains closed. There is no uptake of Na+ and the muscle cells stay relaxed. The transmission of nerve impulses to the muscles is inhibited and facial muscles are relaxed.